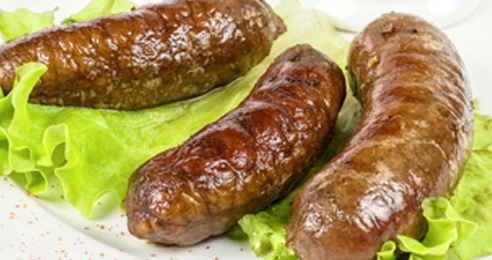 This venison breakfast sausage recipe has been around since my grandfather was a boy, and he was born in the 19th century. It calls for sage, a common breakfast sausage ingredient. More uniquely, it also calls for the addition of mace to the spice mixture. Mace is the ground outer covering of the nutmeg. It is very similar in flavor to nutmeg but is more delicate. I speculate mace may have been less expensive than nutmeg back in those days because it was a by-product, but who knows for sure. I do know it makes for great tasting venison breakfast sausage. Trim the venison of all bloody areas and tough connective tissue, cut it into 1 inch cubes, and grind it through the medium plate of your meat grinder along with the very cold pork fatback..
Pour the spice and water combination into the ground venison and fat and mix thoroughly for at least 2 minutes. Use your hands for mixing to assure even distribution. Once the sausage is fully mixed, either stuff it into casings ( I like large lamb casings best) or make it into patties or bulk packages. Make sure you cool this sausage as soon as it is done. It can be kept in the refrigerator for 2-3 days or in the freezer for up to 3 months. 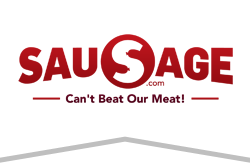 I have been using a vacuum sealer for the last year or so, and find I can now freeze fresh sausage for up to 9 months with little or no loss of flavor or texture. By the way, fatback is the layer of fatty meat found under the skin along the back of a pig (hence the name). If you can’t find it, substitute very fatty pork shoulder or pork fat trimmings. Much to my surprise, I am able to get pork fat trimmings at my local mega-mart. They just looked at me funny when I asked for fatback though.